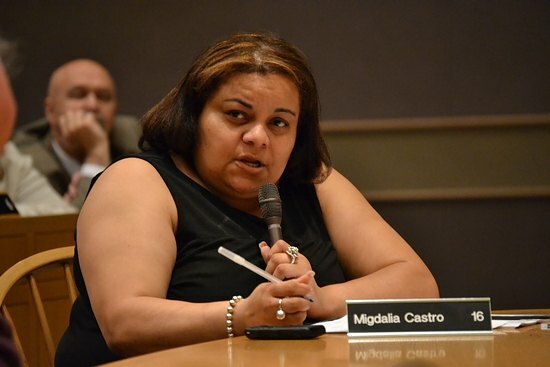 It’s called “Secure Communities.” But Alderwoman Migdalia Castro said the immigration-enforcement program results only in scared communities. Fair Haven’s Alderwoman Castro is the lead name on a resolution submitted to the Board of Aldermen Monday night that would call on Gov. Dannel Malloy to refuse to comply with Secure Communities. That’s a federal initiative that requires local law enforcement officials to share fingerprint information on arrestees with the Department of Homeland Security’s Immigrations and Customs Enforcement agency (ICE), in an effort to enforce immigration violations. The program has already seen significant pushback from state and municipal governments nationwide. See Mary O’Leary’s Register article here. The matter is now headed to committee, where it will be subject to public hearing. Secure Communities is a waste of time and resources and serves only to scare people, she said. “Even the Department of Homeland Security has problems with the way some people have implemented it,” said Hill Alderman Jorge Perez, whose name is also on the submission. The official submission to the board states that under Secure Communities implementation in Fairfield County, the majority of people deported had either no criminal record or only minor offenses. The submission also notes that the program runs counter to the New Haven general order preventing police from asking people about their immigration status. “We’re not interested in the police department becoming immigration enforcers,” Perez said. This entry was posted in Press (Connecticut) on December 6, 2011 by Ian.